New Year’s greetings to anyone reading this post. I see where it was April 2015 that I last updated this site with any new information. I have seen a direct relationship between how much writing I’ve been doing for school and my lack of interest in posting to my blog. In addition to school I’ve been busy working on new music (Work Study Anthology Vol.1-4) a project that’s currently over halfway through with a total time of over 4 hours. The material consists of new and reworked tracks with an emphasis on guitar in a variety of styles. I’ve included a short piece “WSA#19” from these sessions with today’s blog to give you a glimpse of what I’ve been up to. I hope to be completing the project in the next couple of months. Since my updates here have become sporadic to say the least, I’ve decided to call a halt to the blog aspect of this site at least until I finish school and possibly beyond. I’ll continue to make all the existing music here available and some new content also on occasion, but no commentary of consequence. Given how often I’ve been posting here lately, this cessation shouldn’t cause anybody any great concern. I’m hoping however to post music tracks more frequently as part of the ongoing effort here. I want to thank all the folks who’ve taken the time to listen to the music collected on this site. Being a “hobbyist” who loves the studio but hates the stage, this is in all likelihood the only place most people will ever hear any of this music. I’m grateful for the opportunity to do this and again for your interest in my work. Best wishes to all of you in 2017. I hope that this new year of 2015 has been kind so far to you nice folks who visit my website. I wanted to let everybody know that I recently upgraded the workings at this site to optimize it for all current mobile applications. This should make it easy to check my stuff out wherever you happen to be, try it and see if it works. Speaking of works, I’ve been busy with lot’s of schoolwork and music work in the past year. I’ll post an update on a current project soon, but here’s a rough mix of one new piece in the meantime. Again my best to everyone. 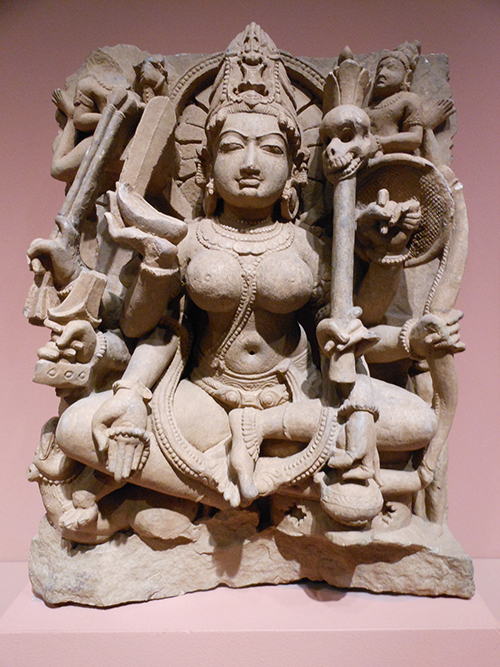 The photo above is of a sandstone image of the Goddess Durga (made in India about 950 C.E. ), part of the permanent collection of the Denver Art Museum. Before I manage to leave this year without updating you at least once again on my musical pursuits, here we go. It’s been a very busy and productive period, not without some unseen circumstances in the mix. While I was lucky enough to escape direct damage from the recent flood here (back in September) many other folks in this area were not so fortunate. It’s hard to describe the power of water and gravity in confluence. The aftermath is amazing and humbling to behold. I had an extra person and an extra cat in residence for a few weeks as a result. In addition to continuing to help the local food bank with picking up donations, I also donated a piece of artwork to an auction sponsored by a local brewery to benefit flood victims, featuring art utilizing their labels in construction (see above image). I’ve been getting out more to jam sessions in Boulder and Denver this year, playing with my friend Chris Filbin and a bunch of other great guys, good times always. Industrial Hemp is in seclusion but still active with Justin Fulford and myself as the core. We’re working on old and new stuff with a mind to reforming as a quartet in the near future (updating the web site soon). I’m also at the beginning phase of work on a soundtrack to a documentary being filmed locally. I’m teaming up with Michael DeLalla (Falling Mountain Music) to score this film in the months to come (my first project with him), and I’m really looking forward to a creative and vibrant process and it’s results. I’m hoping to make a more sincere effort in the New Year to post more frequent updates as to my musical activities. We’ll see what happens. 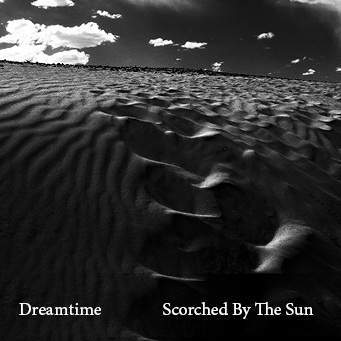 Meanwhile “Dreamtime”the debut work from Scorched by the Sun (Dave Stafford and myself) is being well received. If you haven’t given it a listen, please do. It’s some nice ambiance for a winter’s day or night. I hope all of you who stop by this site have survived comfortably, this year that was, and also that you’ll have peaceful and prosperous times in the New Year to come. Thanks again for listening. New music for this new year…. I have been working with Dave since 1988 and I believe this project is our best recording so far. I look forward to our next effort and encourage you to check out our new release if you enjoy the ambient/electronic genre of music. In other music news- I’m working on recording demos currently with Industrial Hemp and I’m also working on a solo project which will be done later in the year. In addition to that I’m back in school for some global music studies which I’m enjoying greatly. My best wishes in this new year for all you folks who have taken the time to read and listen to my stuff. I’ll try and be more regular in my updates here while staying busy making and learning about music. In the meantime, please take care and if you get a chance, do check out “Dreamtime” I think you’ll like it. I began jamming with a local bass/stick player by the name of Mihaell Baev, Â a very talented and creative guy who I ran into at the local community college and accosted because he had a King Crimson t-shirt on. We played pretty regular for a few months and started working with another guy named Justin Fulford a 7 string guitarist who’s a friend of mine, and a drummer named Mike who was an old friend of Mihaell’s. Anyway the holidays put the brake on time for such activities and the new year began with the news that my father had experienced a severe heart attack and was very near death. I returned to Ohio to see him in the hospital, Â he rebounded somewhat over the next several months, but never recovered due to the severity of his condition. When I returned home in January, the next day I started back to college for the first time in 35 years and found myself Â in a very different mindset about what I wanted to accomplish musically in my life, due to some new perspectives. I took an introductory guitar course from an excellent player and instructor by the name of Matt Dorris, who was very tolerant of all my ingrained bad playing habits and archaic musical references. Matt is the only person other than Robert Fripp that I’ve ever sought guitar instruction from (so far this lifetime), they should both get a medal. At the same time as this I was still rethinking the dynamic of playing music. I played a 3 hour live gig with my friend Chris Filbin on bass for an art gallery opening in February that was well received. 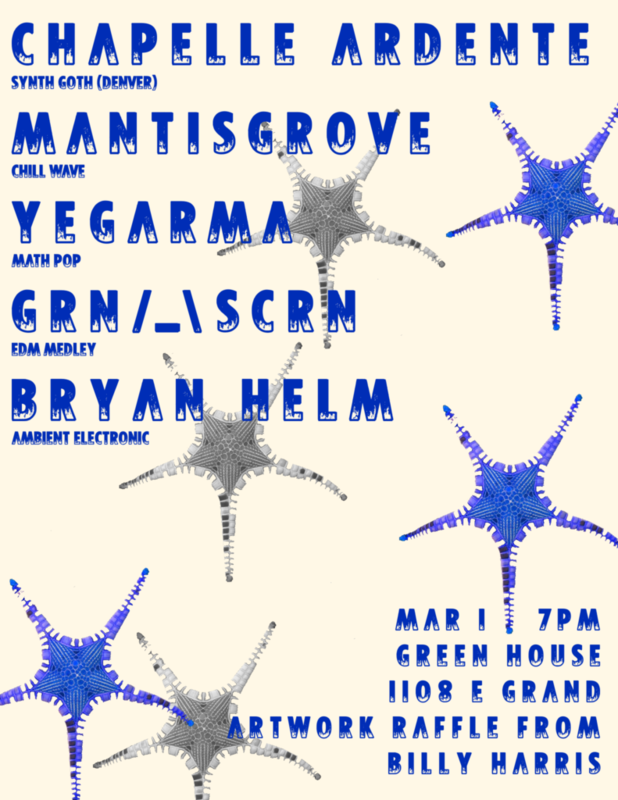 Â We call ourselves “No Evil” a kind of ambient/ space/jazz thing …if you will. Â Chris is a very sympathetic and inventive player and a wonderful guy who you might recall added some great bass tracks to some lapsteel work of mine a couple years back. Chris has some health issues, which makes me all the more grateful when he chooses to spend some of his time and energy playing music with me. Â Unfortunately for Mihaell he was also was not feeling as well as he might and the resultant lull in jamming Â produced the seed that became… Industrial Hemp. IH consists of myself on 6 string guitar/loops/effects , Justin Fulford on 7 string guitar/effects and his brother William Fulford on laptop/beats/samples. So far it’s a trip-hop adventure with a metal bouquet and experimental undertones that has no real boundaries…just fine by me. Â We’re working on our first set Â (about an hour and a half clicks so far)and hoping to record a CD of the best of that material in the fall. At the same time as this is happening my old musical partner Dave Stafford has finished adding his tracks to what will be Scorched by the Sun’s debut effort “Dreamtime” a wonderfully dark ambient work from both of us, that he’s now currently mixing down at his home in Scotland (I’ll let you know when it’s available). So the year marched on with school and much music happening until May when the semester was over. At the end of the month I got word that my father’s condition had taken a turn for the worse and that a visit was in order now, rather than later. I drove back with my wife and our youngest son, visited many times with my parents and saw friends that I hadn’t seen in over 25 years. We had a family get together on Father’s Day and returned to Colorado. My father passed away five days later on the 22nd of June, at home with my Mom in attendance. He had felt so miserable over the last 6 months that he was glad to go, and for his sake I was happy to see him stop suffering. Â I ventured back in July for a celebration of my father’s life that drew about a hundred friends and relatives and stayed a couple of days with my Mom, looking through objects and photos, crying and talking about many things. Before I left for that though I had surgery to repair a hernia, which went very well and I now feel better than I have in years. So as you can tell perhaps it’s been a busy year so far and…school starts on Monday, so it seemed a good time to return to the blog and let you all know what had been going on. On that note I will dedicate myself to regular communications online to keep you up to date on whats going on. For some free tunes and info check out Â www.industrial-hemp.com Â we’ll be updating stuff there soon. I hope this summer has been kind to you, if not… I do understand. Thanks for reading and listening, Â please have fun and be careful and I’ll check back in with you soon. 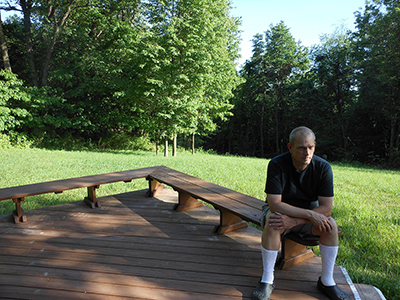 Â Photo of me by Sarajane taken at her Mom’s place in the Ohio countryside circa June 2012. Here on the front range of Colorado, August is in full swing and it’s cooled off a few degrees from yesterday which is pleasant. Just had a wonderful time this past week seeing a couple of very dear friends of ours, who were in from out Oregon way and whom we had not seen in far too long. A loving reminder of the succinct beauty of having true friends in this world. I hope everyone else is having a good summer wherever you might be in this big world of ours. I recently checked in on Facebook to catch a glimpse of some of the people who’ve chosen to follow my blog and was surprised to see over 2400 folks and their smiling (mostly) faces there. My continued thanks to everyone who has taken the time to read and listen here. 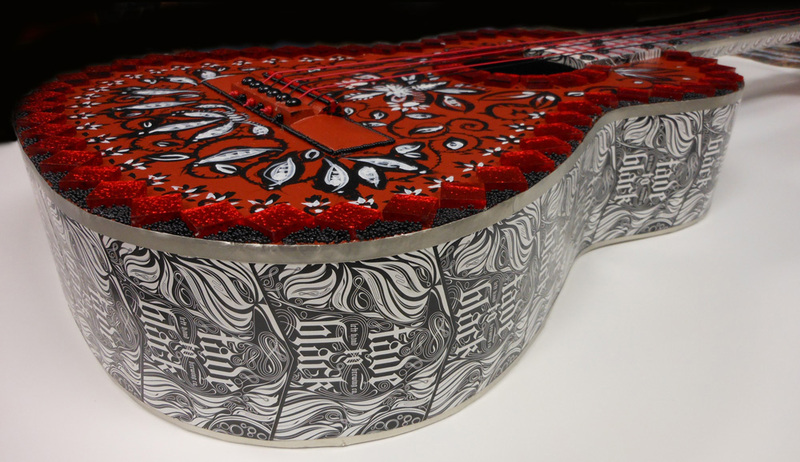 Speaking of listening….the musical selection for this entry is a little mandolin number titled “Five Finger Folly” recorded on a slightly defunct 6 string mandolin that has since been converted to sculpture of an unusual nature. Anyway this is it’s swan song of sorts, but hopefully not mine. I’m busy working on several projects at the moment which I hope to share some examples from soon here. 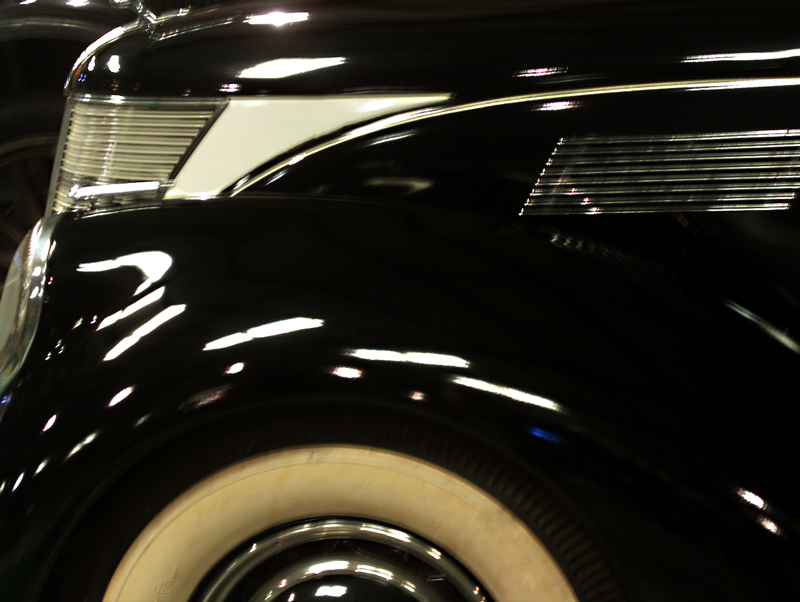 In the meantime please enjoy this tune and another image from my recent trip to the museum. Best wishes to all of you, more soon. for the heart of the shade, as distant from the sun as possible. A warm hello to all of you folks and especially to those of you enduring the sweltering heat that seems to permeate the northern hemisphere this time of year. The weather here has featured some torrential rains along with severe thunder and lightning storms that have little or no moisture content but have started some fires, both grass and structure. So flash flood warnings posted side by side with red flag (fire) warnings make Colorado anything but dull! did I mention the hail? We have hail in the following sizes: pea, marble, golf ball, tennis ball, baseball and softball. All sizes are painful upon delivery. On a hopefully less painful note I’ve been working on more dark ambient reworks of some earlier tracks of mine, which I’m pleased with so far. For today’s musical entry however, I’ve gone to the vault for a piece called “The Pigg Family Has A Party”. It’s a little solo keyboard work meant to accompany a short story my wife Sarajane illustrated and which we then did a short video of for the local cable community access channel , a few years back. Anyway I hope you enjoy it, there’ll be more soon. 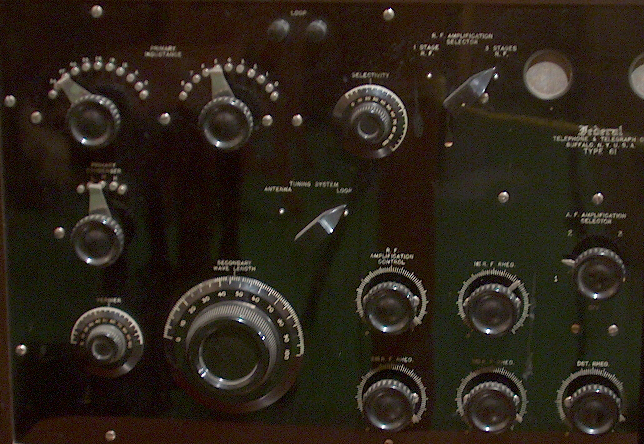 Today’s photo is from another recent trip I made to the Dougherty museum, this image is of a 1922 Federal Radio (six tubes). My best wishes to all of you and thanks again for checking in to see what’s new. 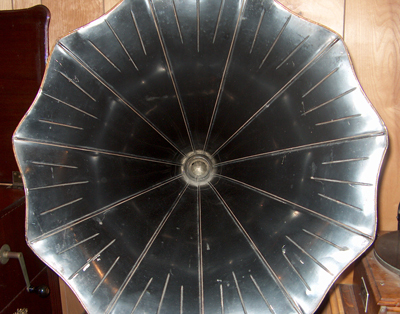 came from inside a device like this: a 1910 Victor Talking Machine with Morning Glory Horn. This particular machine is from the collection featured in the Dougherty Museum located 1 mile south of Longmont Colorado on State Route 287. 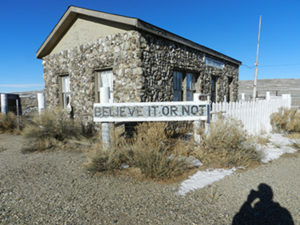 I’ve been meaning to visit this museum for almost 16 years and finally got it together to do so recently They are open from 11 AM to 5PM- Friday,Saturday and Sunday-June, July and August. Admission is 5$ (sign the guest book and get back in free all summer) . 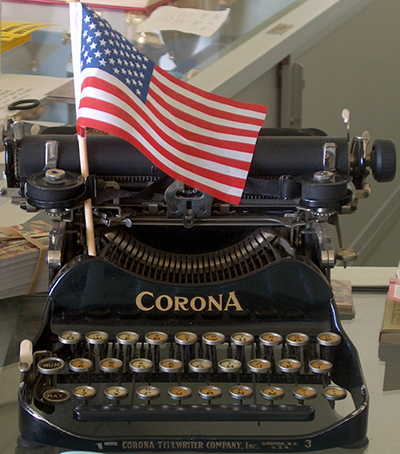 They showcase antique cars, farm equipment,pianos, organs, music boxes, phonographs, and guns. There’s something for everybody. The volunteer staff on site will inform and accompany you as much or as little as you choose on your visit,Â I found them to be charming and helpful folks. Probably not for small children but ten and up should find it a special glimpse into some real history. Speaking of history it seems like it’s been quite a while since I’ve updated you on my musical doings. Currently working on remixing some earlier tracks to manipulate them further with the help of my friend Chris on bass. Looking to perhaps find some new musical landscapes with him on this project.Â Continuing to practice my mandolin in hopes of getting better at playing it. Still knocking around on sound and music files for the film “Omegastop”.Â I’ve also decided to release the tracks I’ve been putting together for Episode #35 as individual pieces rather than a collection and include them as a weekly treat with this blog, starting today with the selection “One Man Funeral”.Â It’s an all solo effort from yours truly featuring looped mandolin and accordion reeds with electric guitar counterpoint as it were.Â We’ll get to even more tunes in the weeks ahead and some more photos also,all of which I hope you’ll enjoy. Meanwhile my thanks again for reading and listening, please take care and have good day. What a beautiful place Antibes is…. After a long but still pretend voyage…. "There's no place like home"….